D’Amicos restaurant in Wangaratta was established in 1986 and has recently undergone internal renovations. 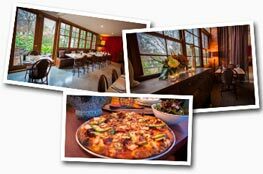 It is open 7 nights per week for dinner and also offers pizza and meal deliveries. It has a seating capacity for 90 and is available for functions, celebrations and business catering. D’Amicos Wangaratta is easily accessed from the Hume Highway (Greta Road exit) on the corner of Vincent Road. Bookings are recommended, particularly on peak weekends. D’Amicos is located in the North East Victorian provincial city of Wangaratta which is at the foothills of the Victorian ski fields and gateway to the wine growing districts of the Milawa Gourment Region & the King Valley. It is 15 minutes from Oxley and Milawa and 30 minutes from Benalla. With a population of over 28,000 Wangaratta is an important business, cultural and tourism hub. It offers good accommodation and dining options, in association with the region’s many annual festivals and recreational events. Each November, it is host to Australia’s Premier Jazz Event, The Wangaratta Festival of Jazz. Other popular regional events include Beechworth Golden Horseshoes Festival, Rutherglen Winery Walkabout, Bright Autumn Festival and Opera in the Alps. Just South of Wangaratta is Winton Raceway, host to V8 Supercar championships and other race meetings throughout the year. The Rural City of Wangaratta boasts three golf clubs and further recreational facilities include the Wangaratta Indoor Sports and Aquatic Centre. Cycling, bushwalking and fishing are popular leisure activities. The City is home to Holy Trinity Anglican Cathedral, Exhibitions Gallery and the Wangaratta Performing Arts Centre.